Continuing on with my series on Chinese Horror, I want to talk about Jiang Shi or 僵尸, and the films that have made them the overriding image of the Chinese Supernatural. The beginning of the 1980s saw the release of a wave of Hong Kong zombie movies such as “Encounter of The Spooky Kind”, featuring those blue green doleful Jiang Shi, that hop around in Qing Dyansty official uniforms. These pioneers and the plethora of imitators, were mostly inspired by the legend of the 湘西 or Xiang Xi Jiang Shi handlers from Hunan. West Huanan is home to the Zhang Jia Jie mountain range, an embodiment of China’s gothic sublime. It’s soaring, impossibly steep pillars, and many impenetrable parts have been the scene of fantasy and horror stories. The 赶尸人 (“Gan Shi Ren”) or corpse handlers, were said to be skilled in the art of leading the walking dead through this mountain range, back to their homes, where they could be finally laid to rest. The standard method of transportation was said to consist of two handlers, at either end of the line of Jiang Shi, with the handler at the back holding a bowl of water. As long as the water was held upright, the Jiang Shi would stay standing. 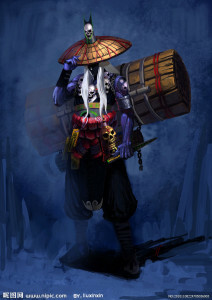 The Jiang Shi would often be dressed up and disguised as living humans, to make them look more respectable, and to stop too many questions from being asked. This would have been one reason why so many Jiang Shi are portrayed in Hong Kong movies dressed in Qing official clothing. The smart outfits were the most uniform clothing to be found in the wardrobe department, owing to the popularity of Qing period dramas. The Jiang Shi’s hands would be tied and placed in front of them on bamboo poles, largely hidden under the wide sleeves of their traditional clothing, carried by the handlers at either ends of the retinue. It was said that the Jiang Shi never spoke, and walked in a peculiar way. We can see from here the origins of the postures of hopping Hong Kong movies zombies, and their out-stretched arms. The first notable film of this legend was “The Case of Walking Corpses”, (1957) directed by Wong Tin Lam,although the first Jiang Shi movies came out during the 1930s, Kung-Leong Yeung’s “Midnight Vampire”, the story of a man who, murdered by his own brother, returns as a Jiang Shi to take his revenge, and “Three Thousand Year Old Vampire”, in which the eponymous corpses emerges from its grave to invade the living world with his army of Jiang Shi. From the English titles of these films, can be seen the beginnings of the confusion between Jiang Shi and vampires (which would be 吸血鬼, “Xi Xue Gui”). Jiang Shi films of the 1950s such as “Strange Tales at Midnight” and “Voyage of the Dead” (also by Yeung) tended to feature not the supernatural, but people disguised as Jiang Shi, in the best traditions of Scooby-Doo, in order to gain revenge, or embezzle a family inheritance. More seasoned fans of British horror may remember the 1974 Shaw and Hammer collaboration “The Legend of the Seven Golden Vampires”, jointly steered by Roy Ward Baker, and Shaw’s major kungfu directior Chang Che, with Peter Cushing pitted against Tsi Ching, a Jiang Shi played by David Chiang (Shaw’s leading kungfu star). Whist this raised the profile of Chinese horror films internationally, it further muddied the waters regarding the Jiang Shi and the vampire. By the 1980s, New Wave cinema had injected new energy and direction into the Chinese horror movie industry. Ann Hui’s “The Spooky Bunch” (1980) with its unique narrative perspective that challenged conventional relations between humans and ghosts, subsequently inspired Sammo Hung to make “Encounters of the Spooky Kind” for Golden Harvest later that same year. “Encounters” combined the gory humour of Evil Dead, with innovative special effects, and excellent action choreography that was to become Hung’s trademark. Amongst the many monsters in the film, is a grey-blue Jiang Shi in Qing style uniform, whose hopping allows him to fly through the air. The cluster of Jiang Shi films were mutually inspiring, propelling the genre to greater heights. Just as “TheSpooky Bunch” inspired “Encounters of the Spooky Kind”, “Encounters” had cast Ching Ying Lam as the Inspector, the type of role that would become his speciality in subsequent Jiang Shi movies. Like Cushing in the Hammer vampire films, Lam was seen as the brave, forthright and skilled Jiang Shi slayer, a role he returned to many times, including the lead in Ricky Lau’s “Mr Vampire”, 1985. “Mr Vampire” was a revolutionary Jiang Shi classic in many ways. From its amalgamation of horror, kungfu andcomedy genres, to the highly successful creation of what would become character archetypes in Jiang Shi films, the charismatic priest, his bumbling disciples and spirited, Western-educated and repatriated wealthy young “princess” who provides eye candy and contrast to the traditional setting. After “Encounters of the Spooky Kind” and “Mr Vampire”, Jiang Shi movies flooded the market and diversified in style and content. The genre even evolved to stories from the Jiang Shi’s viewpoint, with “Jiang Shi Family”, 1986. A Chinese take on “The Munsters”, featuring Jiang Shi parents and their adorable zombie kids. Towards the mid 1990s, the Hong Kong zombie film went into decline due to over-saturation and a lack oforiginality killed the genre. However, with international horror movies from Japan and the West being very well received in China, the genre is being reanimated by films like Juno Mak’s “Rigor Mortis”,2013. Within mainland China, the Jiang Shi has continued to fuel the Chinese imagination. In fact in Hunan today, tourists can now enjoy stage shows inspired by legend of the Xiang Xi Jiang Shi handlers.